Ecology and evolutionary biology is the study of the patterns and processes that structure ecological systems and drive evolutionary change. Understanding the interactions between organisms and their environments is both fascinating and critical for solving environmental problems. 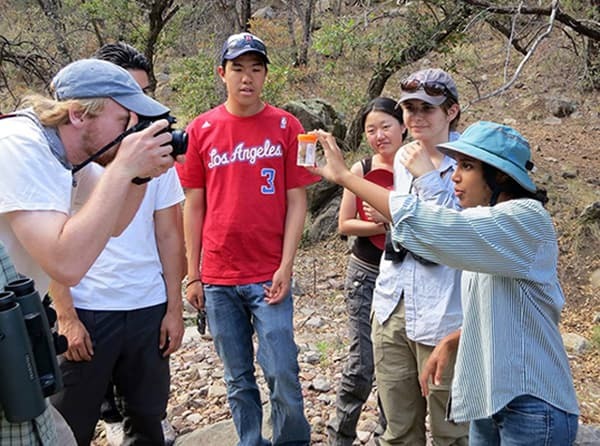 Our undergraduate curriculum is a rich array of innovative lecture, laboratory and field courses that allows students to try out and prepare for diverse career paths in environmental biology, evolutionary biology, or particular kinds of organisms. We invite you to explore the topics listed on our Undergraduate Program page and encourage you to contact us if you have further questions about our program, courses, field experiences and research opportunities. The Graduate Program in Ecology and Evolutionary Biology provides its students with rich opportunities to study organic diversity, including its origins, maintenance and consequences. Our graduate students pursue topics across a broad set of interlinked fields, including ecosystem biology and biogeochemistry, community ecology and population biology, organismal biology, chemical and molecular ecology, population genetics and genomics, speciation and macroevolution.